eMadrid Excellence Network took part in EDUCON once again, a congress hold this year between 17 and 20 of April in Santa Cruz de Tenerife (Canary Islands), focused on the latest trends and challenges in the field of engineering education. Specifically, eMadrid team has participated in a special session on the 19th, with several presentations related to the «multi-learning» experiences of this group, that put together researchers from UC3M, UAM, UCM, UPM, UNED and URJC. The annual IEEE Global Engineering Education Conference, better known as EDUCON, has become an important meeting point for professors, researchers and other professionals, offering attendees an interesting forum for exchange and collaborate on engineering teaching and learning around the world. Sponsored by IEEE Education Society, it's the largest reference in education in the IEEE 8 Region (Europe, Middle East and North Africa). An appointment that this time has been set on a spanish landscape: Canary Islands. La Universidad de La Laguna, la Universidad de Vigo y la Universidad Nacional de Educación a Distancia (UNED) collaborate in its organization. «The hybridization factor of technology in education». Carlos Delgado Kloos, Pedro J. Muñoz-Merino, Carlos Alario Hoyos, Iria Estévez Ayres, María Blanca Ibáñez, Raquel M. Crespo García. Universidad Carlos III de Madrid (UC3M). «Game Learning Analytics is not informagic!». Iván Pérez Colado, Cristina Alonso Fernández, Manuel Freire, Iván Martínez Ortiz y Baltasar Fernández Manjón. Facultad de Informática de la Universidad Complutense de Madrid (UCM). 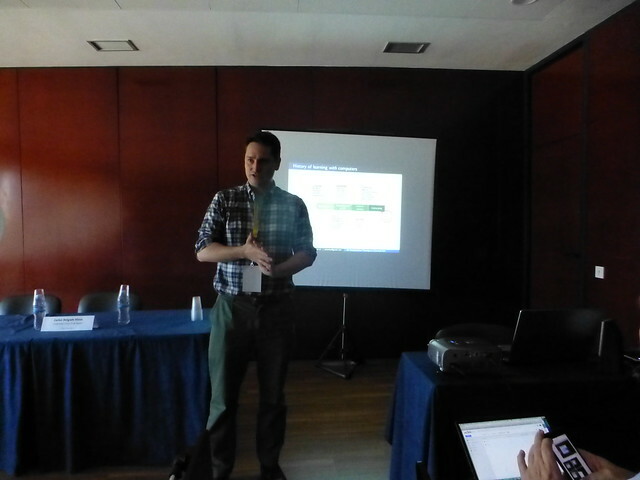 «LOD-CS2013: Multi-Learning through a semantic representation of computer science curricula». Nelson Piedra, Edmundo Tovar. Universidad Técnica Particular de Loja, Universidad Politécnica de Madrid (UPM). «An exploratory analysis on MOOCs retention and certification in two courses of different knowledge areas». Ruth Cobos, Francisco Jurado. Universidad Autónoma de Madrid (UAM). «Using text mining and linked open data to assist the mashup of educational resources». Santa Vallejo Figueroa, Miguel Rodríguez-Artacho, Manuel Castro Gil y Elio San Cristóbal. Universidad de Veracruz (México), Universidad Nacional de Educación a Distancia (UNED). «On computational thinking as a universal skill». Jesús Moreno León, Gregorio Robles, Marcos Román González. Instituto Nacional de Tecnologías Educativas y Formación del Profesorado, Universidad Rey Juan Carlos, Universidad Nacional de Educación a Distancia (UNED).